Sci-fi/Fantasy Styling + Marvelous Manis Pt 1. Loved that Blonds review? Well, there's even more to report on, because the details are outrageous! Styling is a major part of presenting a collection, and the teams at The Blonds went all out. Bright, toon-like eyes with doll lashes make Tweety bird ever-present, and are topped with Spock inspired eyebrows, thanks to lead makeup artist Kabuki for MAC Cosmetics. Nick Irwin of TIGI created the space-age statement-making and Tinkerbell reminiscent hair styles. And rounding out the look were these genius silver headbands with attached Vulcan-like ears. I do hope they make these Vulcan ear headbands available for sale because, I would rock them in a heartbeat! But the styling doesn't stop there. A major ongoing trend on runways has become designer nails. If you're not familiar with the genius that is CND (Creative Nail Design) be ready to be WOWed! Inspired by animation and featuring toon eyes, scales, jewels, circuitry (..?!?!?! 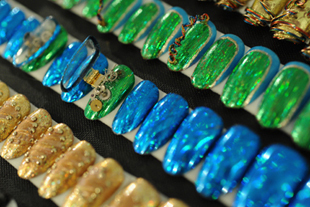 ), CND rolled out 36 individual custom manicures! These miniature works of art need to be seen to be believed, so check out the gallery and let me know what you think! Which look would you rock? Want to see some behind-the-scenes action? Head over to CND's site and check out this revealing backstage editorial video. Look out for pt 2 of this post featuring a slew of geek chic nail art coming your way!